Tranexemic Acid (TA) has been studied extensively over the last few decades with more and more publications which are finding it beneficial in reducing blood loss and transfusions in a variety of settings. The anesthesiologist is often responsible for administering this medication and therefore should maintain a deep understanding of the pitfalls associated with this medication. Naturally, as we begin to add medications to the mix of drugs administered to the patient, there is added risk. However, studies are finding that TA can be beneficial to patients. In general orthopedic surgery a large meta-analysis comprising a variety of procedure types (43 randomized trials) found that TA and Aprotinin led to a reduction of allogeneic blood transfusions . Another meta-analysis looked exclusively at THA and TKAs (29 RCTs) and also found that TA could reduce total blood loss and also reduce blood transfusions . In Obstetrics there have been several trials of low methodological quality that have shown that TA can reduce blood loss or reduce the incidence and dose of uterotonics in conjuction with vaginal delivery and cesarean section. Because of the low quality of previous trials in this area, there has been a great deal of uncertainty as to when, and what dose one might administer TA in the peripartum period. In the EXADELI trial TA patients with post partum hemorrhage of more than 800 mL within 2 hours of vaginal devliery were randomized to TA or placebo. Median blood loss was less (173 mL vs 221 mL P=0.041) in the treatment group . Although this study showed that TA is effective in the treatment of post partum hemorrhage, it did not answer the question of whether TA can prevent post partum hemorrhage. Gungorduk and colleagues showed that the mean estimated blood loss after elective C-section was significantly lower when TA was given prophylactically . An enormous trial (goal enrollment of 15,000 patients) is currently underway to determine the impact of prophylactic TA on mortality and morbidity of post partum hemorrhage. The WOMAN trial began enrollment in 2009. In conclusion, TA has shown some benefit in limited areas as a prophylactic agent to be given prior to surgery. This is particularly important in the arena of orthopedics and obstetrics as will be discussed. Unfortunately TA can be toxic. High dose TA has been linked to seizures in cardiac surgery . IT injection can cause polymyoclonal seizures, or myoclonic seizures combined with intractable ventricular fibrillation can occur [6,7]. Furthermore, when compared to Epsilon Amino Caproic Acid (EACA), and Aprotinin, several studies have shown that the incidence of seizures is higher [8-10]. A large cohort with multivariate anaylysis found that TA had an OR of 7.4 for the detection of seizures after surgery when TA was used in higher than typical clinical doses (i.e. up to 100 mg/kg) . TA has been found to be a competitive antagonist of the inhibitory neurotransmitter glycine in mice. In mice it also increased the rate of seizure-like events in neocortical slices, which can be attenuated by isoflorane or propofol. Spinal anesthesia for THA and TKA is gaining some traction and popularity. A recent article in Anesthesiology News cited a study in which a large database was mined for practices between board certified anesthesiologists and non board certified anesthesiologists. The article indicated that board certified anesthesiologists were much more likely to use regional anesthesia for TKAs and THAs including neuraxial techniques. Recently several articles have found an association between neuraxial anesthesia for TKAs and THAs and improved outcomes such as lower incidence of admission to the ICU, decreased blood losss, lower risk for blood clots, fewer organ specific complications and decreased mortatlity . Therefore, two trends that may combine to produce a dangerous result seem to be converging. Recently, I was approached and asked my thoughts about the following scenario. A women presented for a bipolar after fracture of the femoral head. A CRNA performed a spinal for the procedure. The patient was placed supine for the foley, which was complicated because of "jerkiness" of the lower extremities. This continued, and therefore, it was decided to proceed with GETA. However, recurrent "jerks" of the legs continued during the surgery despite increasing depths of anesthesia. It is not clear if neuromuscular blockade was attempted. In recovery, the patient experienced several generalized myoclonic seizures and pupils were noted to be dilated and non reactive. On the following day, an EEG confirmed status epilepticus. The patient has since required tracheotomy and gastric feeding tube placement with uncertain recovery. As I considered the sequence of events described it didn't occur to me that I had read a related case report a few years back in APSF. In the Spring edition (2010) a case was written up where a 21 y/o female presenting for cesarean section of twins at 37 weeks due to painless vaginal bleeding was given a spinal which lead to her demise within a few hours. The clinical description of events was uncannily similar to the events as described to me. After three minutes of injecting the spinal dose of "bupivacaine" the patient began tossing and turning with complaints of sharp pain from her waist to her lower extremeties. GETA was induced due to lack of sensorimotor block with delivery of healthy twins. After surgery the patient developed a tacharrhythmia treated with lidocaine. However, the patient now developed severe "jerking" movements in all her extremities with nystagmus consistent with seizure activity. Pupils were alternating between maximally dilated and constricted. She again developed VT, then VF, then asystole from which one hour of CPR failed to revive her. Later, a used vial of TA was discovered in the waste bin. 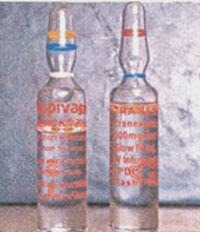 The appearance of the ampules of bupivacaine and TA were similar (see figure). The authors of this case report noted four other case reports wherein three had survived the injection and the fourth had perished. Mortality seemed to be associated with dose [5,7,17,18]. After the article in the APSF was published another case report emerged . In this most recent case, the events seemed nearly identical to those described by Firouzeh V et al. in the APSF article. A 23 year old women presenting for cesarean section was given a spinal after which the patient complained of pain in her back and gluteal region. This was followed by intermittent involuntary movements of her lower limbs. This patient developed bradycarida which was treated with atropine and was transferred to another facility. This patient developed dilated fixed pupils and GCS of 2/15. She was hypotensive on two vasopressors. This patient went on to develop tachyarrthymias with three episodes of VT and passed away after 24 hours. Yet another report appeared in 2011, one year after the APSF article . This case was different from the two mentioned above in that only 80 mg of TA were injected. The patient a healthy ASA I male suffered severe tonic clonic convulsions, and was essentially placed on a phenobarbital drip for several days. Amiodarone was infused to prevent VF. On POD 4 his neurological exam had returned to baseline and he was discharged without sequelae. However, Garcha PS and colleagues  reported a death in a 55 year old woman scheduled to have an ORIF of a tibial fracture. After injection (of 250 mg TA), she reported severe burning pain on both lower limbs. In this case, after 10 min she developed myoclonic twitching of her face. Twenty-five minutes after injection she became hypotensive and became unconscious. She died 10 hours later ultimately due to VF. 1999-50 mg 68 male-residual bilateral peroneal nerve palsy. after 2003-350 mg 35 female for cholecystectomy-DEATH after 5 hours. 2013-250 mg 23 female for C-section-DEATH after 24 hrs. 2013-200 mg 27 female for C-section-DEATH at 48 hrs. The general progression of events with some minor variations in the various case reports is severe burning pain in the lower limbs and gluteal region which are typically followed by myoclonic "jerking" of the lower limbs. This is often accompanied by or followed by large hemodynamic instability. Most commonly reports are of hypertension with tachycardia. The hemodynamic instability is almost universally followed by ventricular tachyarrythmias which are almost always the proximate cause of death. Animal studies have clearly shown that TA injection into the CSF will cause seizures. The mechanism involved is thought to be related to TA blockade of the inhibitory action of GABA-a receptors leading to hyper excitability of the CNS. It is clear from the case reports that after IT injection of TA, the medication will remain in the CSF for up to 3 or more hours. Yeh  and colleagues hypothesized about further damage resulting from a large sympathetic surge after IT injection of TA. In their case report the patient developed elevated blood pressure after the injection (200/130 mmHg from 130/80 mmHg). This was followed in a short time by refractory VF after which the patient expired. Kaabachi  et al. also described elevation of blood pressure after IT injection of TA (160/100 mmHg) with tachycardia (HR 120 beats/min). Mahmoud  et al. also reported severe hypertension with tachycardia immediately following complaints of severe burning pain of the lower limbs (170/95 mmHg; 130 beats/min). Their patient also experienced hyperthermia as also reported in other instances of IT TA. On the other hand, Raghu  et al. reported that after IT TA injection a 23 year old female developed hypotension and required dual vasopressor therapy with BP of 70/40 mmHg. In this patient, echocardiography demonstrated global hypokinesia and severe ventricular dysfunction with EF of 15%. This patient expired 24 hrs after admission. This case could represent an analog to neurogenic sympathetic discharge cardiomyopathy also referred to as Takotsubo cardiomyopathy or stress cardiomyopathy. See write up here. In a rat model, high dose epinephrine infusion mimicked the clincial findings of Takotsubo cardiomyopathy whereas, a norepinephrine infusion did not . Also, in Takotsubo cardiomyopathy, patients who survive the initial sympathetic storm will recover without sequelae as has been found to be true in the various case reports presented. Neurogenic hypertension as seen clinically in TBI and subarachnoid hemorrohage has been mimicked in a rat model with bilateral lesions of the Nucleus Tractus Solitarii (NTS) . The NTS is a primary site of termination of baroreceptors and plays an important role in the integration of inhibitory regulation in the sympathetic nervous system. Bilateral lesions here result in the rapid development of acute fulminating hypertension from augmentation of sympathetic nerve activity, excessive catecholamine release into the plasma followed by a marked increase in peripheral resistance, which leads to reduced cardiac output, progressive heart failure, pulmonary edema and death. In the bilateral lesion of the NTS in a rat model, it was found that initial treatment of the beta blocker propranolol was deleterious whereas, treatment with an alpha 1 blocker (Prazosin) prevented cardiac hypercontractility, preserved cardiac output, and reversed the pathological changes of contraction band necrosis in heart muscle . The authors of this study concluded that in neurogenic or sympathetic discharge scenarios, initiating thereapy with beta blockers is harmful and will worsen outcome, whereas, initial treatment with Alpha 1 blockers (i.e. Prazosin) will improve mortality. The authors also note that after the initial 6 to 12 hours of stabilization, beta blockers can be added without fear of harm to decrease the impending tachycardia . Management of suspected IT injection of TA remains difficult. In all of the above case reports management was supportive with hemodynamic control, mechanical ventilation, and treatment of seizures. Both Butala et al. and Mohseni et al. reported in their respective case reports that phenytoin did not terminate polymyoclonus, but the addition of sodium valproate was effective. In one case report where a small dose was given (80 mg) phenobarbital proved effective in seizure management. Butala et al. also instituted CSF lavage within 30 minutes of injection and the operation was cancelled. This is the only report where the case was cancelled and therapeutic CSF lavage was utilized. Importantly, the patient survived despite a large dose (300 mg). In the extant literature on this topic, all deaths have occurred in females with the exception of this one case. CSF lavage has been reported to be effective in other instances to treat inadvertent injection into the IT space[1,2,3]. In these reports, 10 to 20 mL of CSF are slowly withdrawn and replaced with NS preservative free. Given the very high rate of death after the IT injection of TA, vigorous CSF lavage would seem prudent. Sodium valproate is probably first line to treat myoclonus. Supportive therapy with alpha 1 blockers as first line antihypertensives are recommended with beta blockers given later if necessary. In each of the cases above, the provider attempted to perform a spinal anesthetic with hyperbaric bupivacaine 0.5%. In the overwhelming majority of cases where a detailed description is available, the anesthestist injecting the medication was not the one who prepared the injection. In fact, as one reads the numerous case reports there are two themes that jump out. The providers are depending upon another individual to prepare their IT injection and are using a kit that does not come with the bupivicaine packaged inside. This highlights the importance of preparing your own spinal injectate, and encouraging the use of spinal kits with prepackaged spinal local anesthetics. When additives are required that are not packaged in the kit, additional care should be taken to read the labels carefully although this should go without saying. Unfortunately, despite a well written APSF article in 2010 warning of the danger of TA injection into the IT space, this continues to occur. Raising awareness of this possibility remains important and furthermore, rapid treatment of the symptoms of burning in the lower extremities and gluteal region with CSF lavage is likely to prove effective. 1. Lui H. A&A. 2005;100(4):1215. 2. Tsui BC, Malherbe S, Koller J, Aronyk K. A&A 2004;98:434-6. 3. Al Fereayan A, Russell NA, Al Wohaibi M, Awada A, Scherman B. Childs Nerv Syst 1999;15:87-9. 4. Murkin JM et al. A&A 2010;110:350-3. 5. Mohseni et al. A&A 2009;108:1984. 6. Garcha PS et al. A&A 2007;241-2. 7. Yeh HM et al. Anesthesiology 2003;98:270. 8. Martin K. et al. A&A 2008; 107:1783. 9. Martin K et al. J Cardiothorac Anesth 2011;25:20-5. 10. Keyl C et al. Eur J Cardiothorac Surg 2011;39:e114. 11. Kalavrouziotis D et al. Ann Thorac Surg 2012;93:148. 12. Zufferey et al. Anesthesiology 2006;105: 1034. 13. Kagoma YK et al. Thromb Res 2009;123:687. 14. Ducloy-Bouthors AS et al. Critical Care 2011;15:R117. 15. Gungorduk K et al. Am J Perinatol 2011;28:233-40. 16. Memtsoudis et al. Anesthesiology 2013;118:1046. 17. Wong JO et al. Ma Zui Xue Za Zhi 1988;26:249-52. 19. Raghu K et al. Intern J Neuro Spine Sciences 2013:1 issue 1. 25. Paur H. Circulation 2012;126:697-706. 27. Sabzi F et al. J The Univ Heart Ctr 2009;4:253-5.